Oulton Park occupies a very special place in the annals of BTCC history, not least as it’s known for turning up thrilling, action-packed racing up and down the grid, and 2018’s trio of races most certainly did not disappoint in this respect. Blazing hot weather and cloudless skies greeted the BTCC circus as it pitched up at the Cheshire track, and while the total absence of rain meant that the conditions were pretty much ideal for racing, the tight confines of Oulton Park’s layout ensured that there was much to discuss, both in terms of overtaking and on (and off) track paint-swapping! One thing worth noting before we dive into how Team Dynamics and Power Maxed Racing got on, the tight confines of Oulton Park mean that overtaking is trickier than you might expect, and also that carrying success ballast becomes even more of a penalty than it might normally be, which explains why both teams (and the Power Maxed Astra Ks in particular) struggled to make an impression in the opening pair of race. 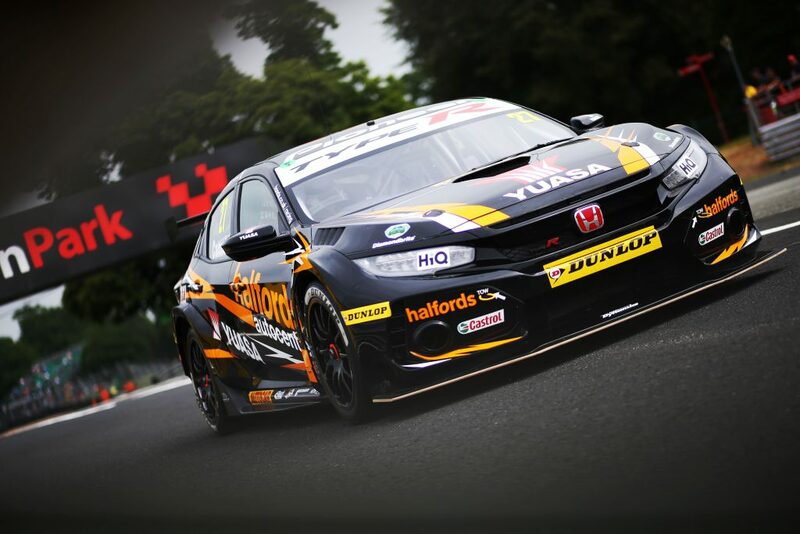 The Hondas of Dan Cammish and Matt Neal were amongst those hardest hit by the need to carry success ballast into Oulton Park, with the latter particularly hard hit – he was forced to qualify with a massive 33kg! Not that it appeared to hamper him unduly, the BTCC veteran able to record a time good enough for 5thon the grid, while team mate Cammish was 2 tenths of a second slower yet qualified in 14th, clear evidence of the closeness of the UK’s premier race series. Race one saw the Honda Civic of Matt Simpson scrabble away from pole and into a lead he’d hold until the end, leaving the rest of the field (including the works Civics) playing catch up. The sheer amount of ballast being carried by the black and orange Hondas hampered their progress up the order, meaning Neal concluded the race where he started (in 5th), while Cammish made up one position to end the race in 13th. An incident-packed second race enabled Neal to make further progress up the running order, his task aided by opting to run on the option tyre. Up to 3rdby the third lap of the race, Neal set about battling the Focus of Tom Chilton for 2nd, lunging up the inside of the Ford a few laps later to steal 2nd, a place he’s hold to the end of the race. Cammish was clouted on the rear in the opening melee and his race was therefore compromised, the team’s newest signing crossing the line in 12th. 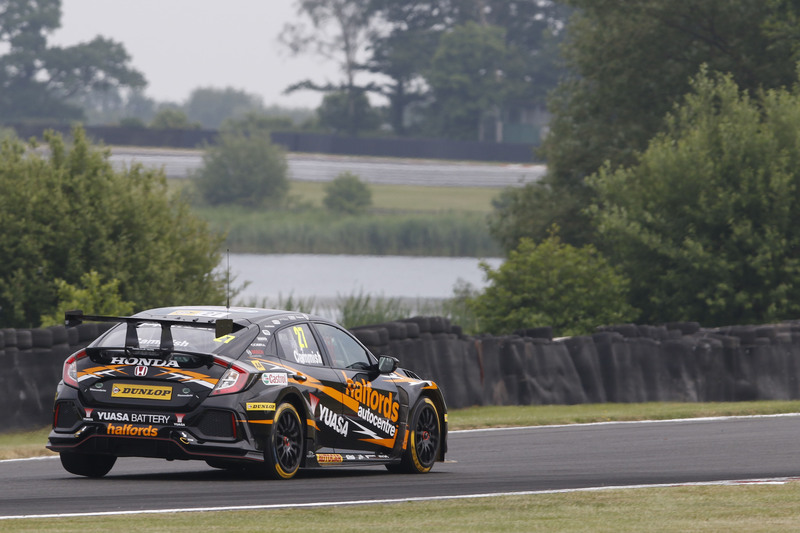 Race three proved to be both challenging and a disappointing way for the Team Dynamics Hondas to conclude their trip to Cheshire, with Matt Neal crossing the line in 14thafter a coming together with Tom Ingram, while Cammish retired partway through with a puncture. Power Maxed Racing have found themselves at the sharp end of the championship chase in 2018 and have been forced to compete with a hefty weight ballast penalty as a result, which helps explain why the Astras of Senna Proctor and Josh Cook struggled to make an impression at Oulton, certainly by their own high standards. 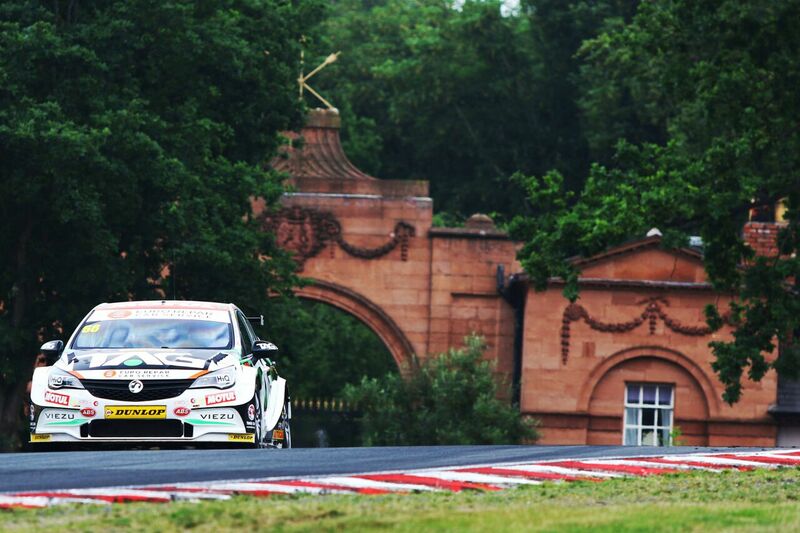 Still, it’s a measure of the ever improving pace of the Astra and the growing experience of Power Maxed Racing as a team that its drivers were able to leave Oulton Park with strong championship standings, Proctor just outside the top ten in 11th, Cook in 5th, just three points off Tom Ingram in 4th. The impact of the ballast on the Power Maxed Vauxhalls was most apparent in the opening race of the weekend, with both Cook and Proctor struggling to make any meaningful improvement on their qualifying positions (20thand 26threspectively). Cook faired best in this respect, climbing to 17thby the flag, nine places ahead of his team mate. Race two brought more of the same, the Power Maxed pairing setting about extracting as many points from a tough weekend as possible, effectively putting them both in damage limitation mode. 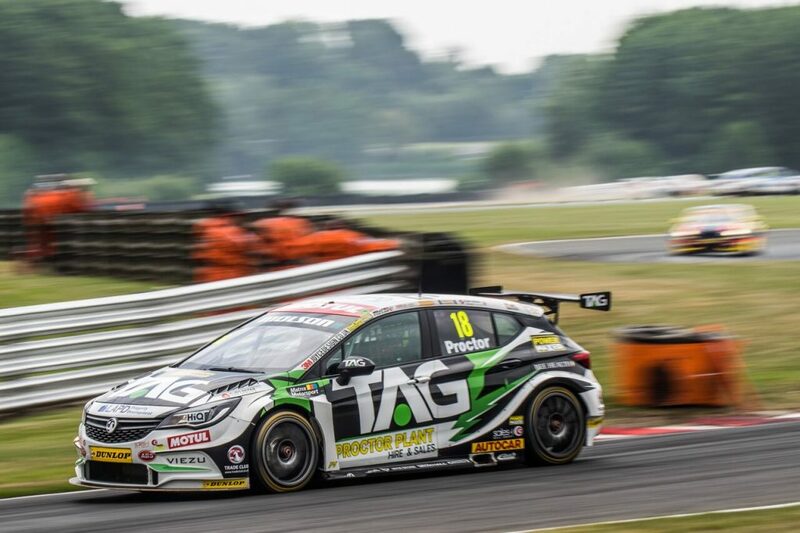 This time it was Proctor that enjoyed a better run of form though, taking the flag in P16, with team mate Cook four places further back in 20th. The third and final race of the day presented those saddled with success baggage with a chance to really make some progress, and that’s precisely what Cook and Proctor did. 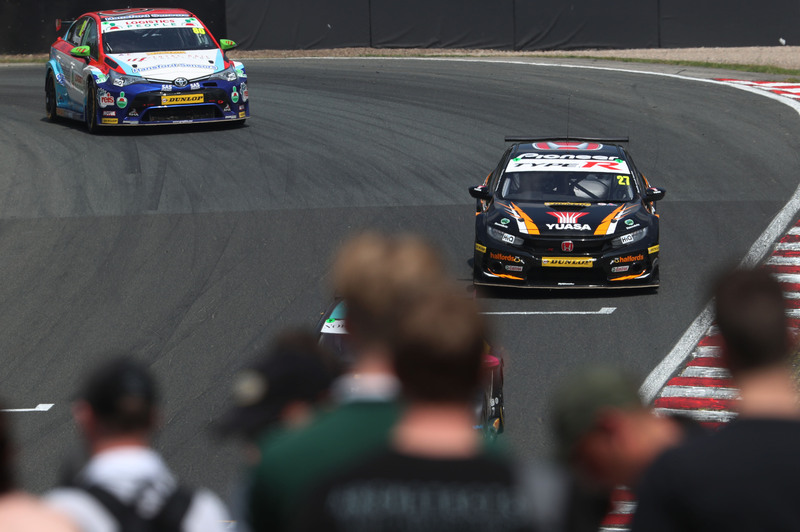 The pairing were grouped in a knot of hard-charging cars for much of the race, battling hard on Oulton’s tricky mix of off-camber corners and near blind crests.